If Bear wins, he would be the first Native American member of Congress from New England and the first in more than a century to claim a House seat from the East Coast. Bear said he thought his parents, both dead, would be tickled and proud to see their oldest son aiming so high. 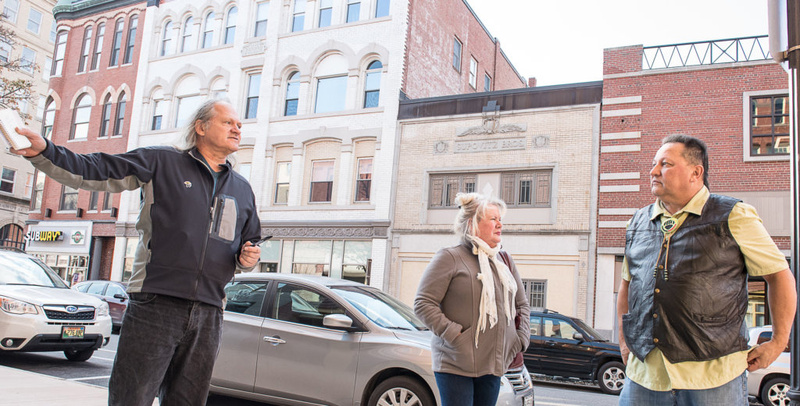 He came to his old hometown last week to try to find a good spot for a campaign headquarters, probably on Lisbon Street, where he can set up a base for a long-shot bid to knock out U.S. Rep. Bruce Poliquin, a two-term Republican who is up for re-election in 2018. In addition to the Green Party’s Bear, six Democrats are vying for the job, including state Rep. Jared Golden, D-Lewiston, whom Bear called “a good friend” and “a great guy.” There’s also at least one independent, Portland lawyer Tiffany Bond. So it’s shaping up to be a crowded field. One day at the age of 10, after a successful stint selling arts and crafts door to door, Bear returned home to find his mother sobbing and all of his siblings gone. He said he took off to a ramshackle little camp he’d created for himself by a railroad trestle across the Androscoggin River, a place he could hang out where nobody could find him. “I’d sleep under that bridge right in the middle of the river,” Bear said. He held out for a couple of weeks before he got lonely enough to return home, ready to embrace his fate. “Go ahead and call them,” he told his mom. His father belonged to the Houlton Band of Maliseet Indians, hailing from one of many Native American families in Maine who made a living peddling goods, picking apples, raking blueberries, digging potatoes and other temporary work. He wound up doing all sorts of jobs, too, including helping to clear the land north of Gardiner for construction of a Maine Turnpike extension and overseeing boot production in a Lewiston factory. His French Canadian mother, who probably had some Indian blood, kept busy raising children in their Roman Catholic household and earning some money sewing moccasins. Most of the time, they lived “down in Little Canada” with a mass of immigrants who worked in the mills, took home piecework to earn a little extra and struggled to get by. Bear remembers going to the shore to catch mackerel and then selling the fish by “running up and down the stairs” all through the neighborhood. They’d also pick blueberries near the interstate in New Gloucester that they’d hawk for 50 cents a quart. They’d pick up free wood in Topsham, he said, and sell it to people who dumped it in their basements to fuel old-fashioned boilers for heat. For his help, Bear said, he’d get the change in his father’s pockets, sometimes as much as $3. They’d get sandwiches out once in a while, or a Moxie that he’d mix with milk. What he learned from his father, he said, is that work is a constant. Bear said his mother’s family never quite accepted the Native American man who married their daughter. There was, he said, “a lot of racism” that he didn’t quite understand at the time. That wasn’t all of it, though. At some point, Bear’s mother sought a protective order to keep his father away from her and soon divorced him. The children ended up living with their mother in dire poverty while his father drank. Bear said his dad could never get over it. “All his life he would love her,” Bear said, still lamenting whatever had happened when he died at age 70 decades later. Given all of the work and hard times, it’s not surprising that Bear’s education suffered. At school, Bear said, he always felt he was treated differently than most of the children, perhaps because he was so poor, perhaps because of his heritage. Many classmates had little to do with him, he said, though those who did remain his solid friends. Cousin Rick Boucher remembered visiting Bear’s mother’s home shortly before the state stepped in. Though his family struggled, too, he said it struck him even then how poor his aunt and cousins were. “You had nothing,” Boucher told Bear. “She had a nervous breakdown,” and the state intervened, Bear said. During the next seven years, Bear stayed with four foster families in Auburn, each treating him kindly. Bear said he benefited from seeing how other people lived and absorbed some of their values and ideas along the way. What he appreciated most, however, was the willingness of his foster parents to let him spend time with his father and with tribal members. By age 13, he was able to make trips to the reservation in the Maliseet Tribal Lands within the St. John River basin that straddled the northern border of Maine. He said that exposure to the tribe made him realize “that I wasn’t so different” from them, that he shared a proud heritage, that he had a people abused by history but still intact. The federal government formally recognized the Houlton Band in 1980. He quickly met and married Violet Dotson, an Army brat from Virginia who was part of the first group of women to go to boot camp. She helped him get his General Educational Development certificate and stood by him as he embarked on a 15-year career with the service. They have four daughters, all of whom live in Maine now. They also have 10 grandchildren and four great-grandchildren. 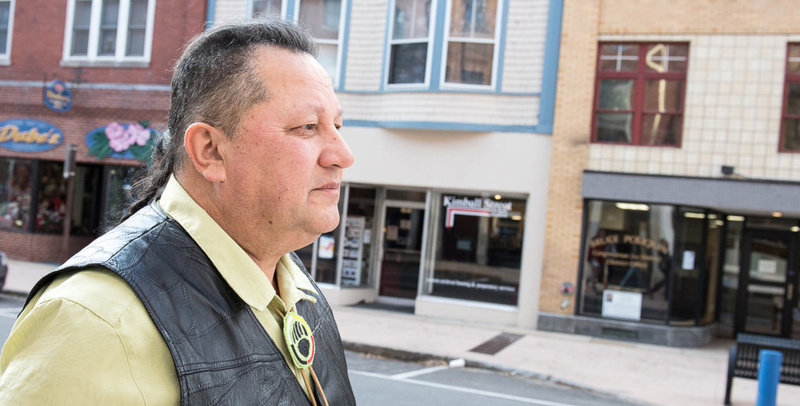 He soon wound up as president of the Central Maine Indian Council and not long after was elected as a tribal council member. Living in a cedar log cabin that family members helped him build, Bear watched as a relative snagged a salmon out of the river with his bare hands. Those fish led him to college and law school, paid for by the tribe, so he could lend a hand with the Maliseets’ fight to hold on to rights guaranteed long ago by treaty.